This week we have arrived at Impel Trading Card #29. One of my favourite figures of all time. Ladies (there are some of you reading this right?) 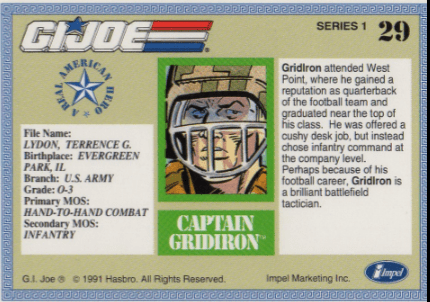 and Gents, I present you Captain Grid-Iron (or Gridiron). Released as a figure in 1990, only one version of the figure has ever been released. He came with a lot of accessories, but the coolest thing about the figure are his football shaped grenades. 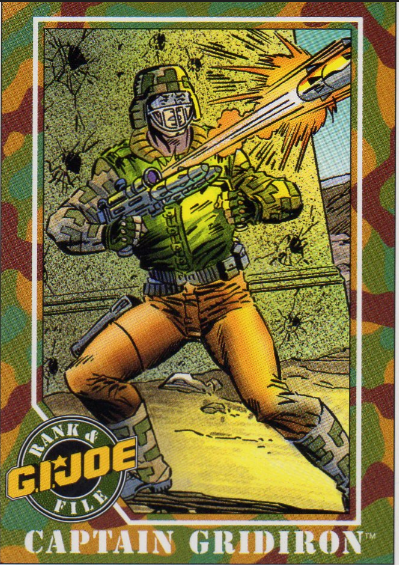 His codename is written as Grid-Iron on the filecard, but on the Trading Card they wrote it without the hyphen. In the Marvel Comics, he is seen in just one comic. The Devil´s Due run has him featuring on the cover of issue #25. Most people will remember Grid-Iron from his appearances in the DIC cartoon series. He is in charge of the team in absence of Hawk and Sgt. Slaughter. The most memorable episode is the one in which the Joes play a football match against Cobra… Genius, right. (See Youtube). On the subject of football, you can´t really call that game football now can you? A few weeks ago, the same discussion was shown in The Grand Tour on Amazon Prime. In Europe, we have a whole different opinion on what football (what the Americans like to call soccer) is. I looked over the whole football difference, for me, Captain Grid-Iron was a cool figure, with a lot of accessories. Every Joe collector should definitely have this figure in his/her collection. Next Next post: Street Closed. Do not enter. Detour.